“Mommy, you make the best bread!” Top Gun said as he happily munched on a slice of baked Boston brown bread. 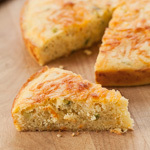 We made this to go with our slow cooker Boston baked beans, and the boys later enjoyed slices of it with butter as an after school snack. 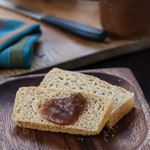 And like those baked beans, this bread is another easy recipe that the kids can help make, or even make on their own. 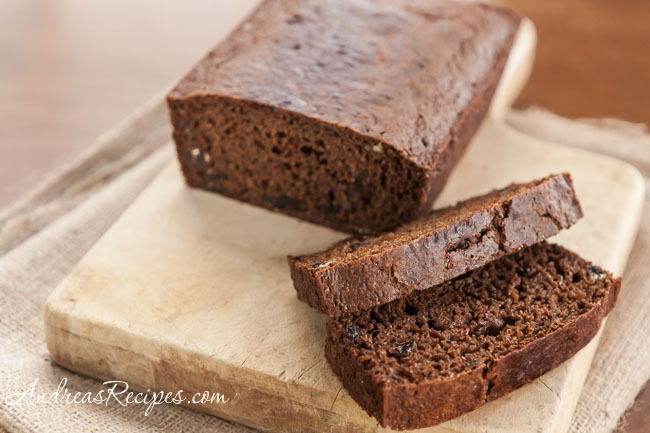 Traditional Boston brown bread is steamed in cans for a couple hours, something you may remember your mother or grandmother doing. I’ve been tempted to try it, and I hate to sound cranky, but cans aren’t what they used to be with all the modern coated linings which I would not want to put in a hot oven with my bread. So I bake in pans instead, and we’re happy with the flavor and texture, even if it’s not exactly like the method we fondly remember. I use rye flour, but you can also use whole wheat or graham flour. Many original recipes for Boston brown bread call for melted shortening, but I use canola oil instead. If you don’t have buttermilk, you can make your own by pouring a couple tablespoons of lemon juice in a measuring cup then adding lowfat milk until you have two cups, then letting it rest on the counter for about 5 to 10 minutes until it sours. Place rack in the middle of the oven and preheat to 350° F/175° C.
In the large mixing bowl, whisk together the all-purpose flour, rye flour, cornmeal, baking soda, and raisins. In the medium mixing bowl, stir together the canola oil, egg, buttermilk, and molasses. Stir into the flour mixture, just enough to mix it all together completely, but do not over mix. Pour into the prepared loaf pans, distributing the batter evenly. Baked in the preheated oven until a toothpick inserted in the middle of the loaf comes out clean, about 45 minutes. Cool for 10 minutes in the pans, then turn out onto wire racks to finish cooling. I haven’t had brown bread in ages! Thanks for reminding me just how good it is. 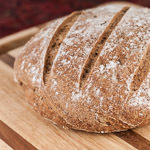 Oh, I almost forgot to thank you for linking to my whole wheat Irish soda bread (also popular in Boston). Did I read that recipe correctly? NO yeast and NO kneading?! Perhaps a bread recipe that I’m not afraid to tackle. Thanks, Andrea! I have a special insert for my crock pot that makes a great “steamed” bread. Sounds delicious. And I didn’t know that about the bread being steamed in cans so I learned something! I was actually just reading up on Boston brown bread this week as I was exploring ideas for team-themed Super Bowl panini. Glad to see the non-can option, that had me a little wary. It sounds terrific! Thank you, so much, for this recipe. If you want to ‘steam’ it in the oven, just have a bowl of water off to the side during baking and that will give you very close to the same result as when cooked in the cans. Love this. Come visit when you can. The steamer insert for the crock pot works great. If you shop at junk stores or antique malls, you can occasionally find steamers that are meant to be used on the stovetop with your own pan. These steamers have lids that fit tightly or sometimes screw on. Don’t buy one without the lid. They’re also used for steamed “puddings” like plum pudding or figgy pudding. Thank you! I came hear for confirmation yesterday that I could bake my brown bread rather than steam it in the oven for 3 hours. It was an hour before my kids were due to fall apart with hunger, and the five-year-old and I had just gotten out all the ingredients and were scanning the steps in the magazine recipe when I came to the 3 hour bit. We followed your technique and it came out perfectly. The kid called it dinner cake. I just had another slice for breakfast with my coffee. Andrea, thank you for your site. I’m not much on cooking so I wonder where you could direct me to purchase B&M in cans. It looks like every one is bailing out from carrying inventory around here in Richmond VA. Has this company gone out of business? If not, do you know if it sells direct to the consumer? Can you make this without raisins? Hi Mandy. Yes, you can skip the raisins. Let me know how it turns out for you!